March 1943. "New Orleans, Louisiana. 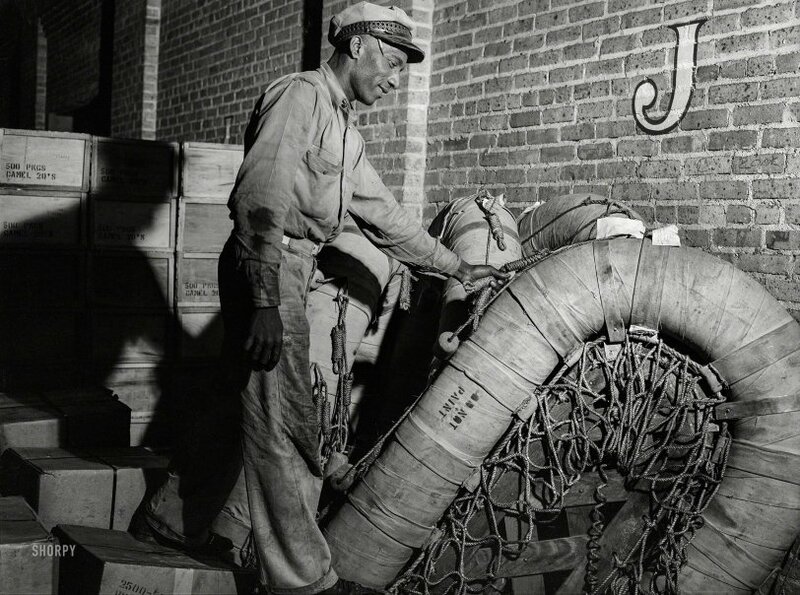 Loading a rubber raft onto a truck at the terminal of Associated Transport Company." Medium format negative by John Vachon for the Office of War Information. View full size. I'm reading the book "Unbroken"
Submitted by ndnchf on Wed, 03/20/2019 - 1:27pm. about three downed B-24 fliers (eventually two) who floated in the Pacific for 47 days before being captured by the Japanese. They constantly had to fend off shark attacks. 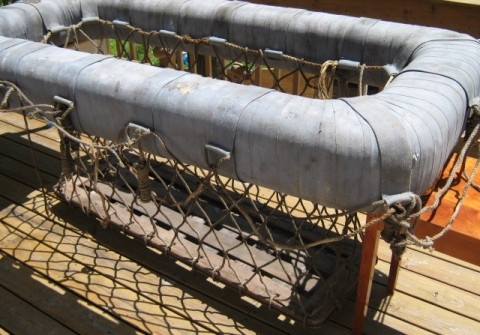 That raft with the floor suspended by ropes is for sharks, similar to browsing the butcher shop meat case. I doubt it was very popular with shipwreck survivors. Submitted by GarandFan on Wed, 03/20/2019 - 12:54pm. Well that explains why those things always looked so scruffy. Submitted by Phare Pleigh on Wed, 03/20/2019 - 10:17am. New Orleans was a major center of war production in WWII including Higgins Boats landing craft and on the South Bank at Avondale, tug boats, destroyers and destroyer escorts. Perhaps the life rafts are headed for new ships under construction and the Camels to a more immediate use. Submitted by JamesVRoy on Wed, 03/20/2019 - 9:46am. I didn't know this before but looking at the raft in particular in detail made me do some research. Evidently the type is made from Balsa wood wrapped in canvas. It has a wood floor that suspends from the ropes. I supposed that's a bit more stable than the inflatable type though probably a lot less comfortable over time. Submitted by Speed on Wed, 03/20/2019 - 9:14am. I believe that is a Carley float --a kapok or cork ring covered with canvas. Submitted by JamesVRoy on Wed, 03/20/2019 - 8:13am. 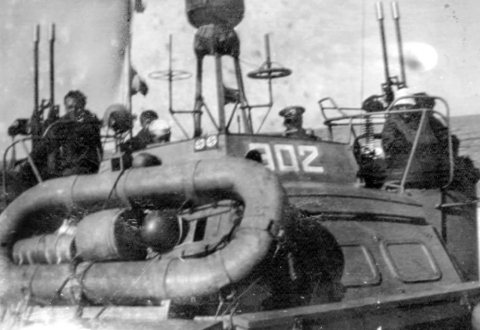 but it closely resembles the type used on PT Boats in the war, especially as used on the Higgins built there in New Orleans. Submitted by AleHouseMug on Wed, 03/20/2019 - 6:07am. That's a serious amount of cigarettes, in some serious crates back there - 500 packs of 20 smokes each! Submitted by Carey on Tue, 03/19/2019 - 11:22pm. At least they'll have plenty of cigs on the raft. Submitted by davidk on Thu, 03/21/2019 - 5:11am. At least that many Camel cigarettes. We see 3 stacks by 6 crates high = 18 x 10,000 cigs per crate.